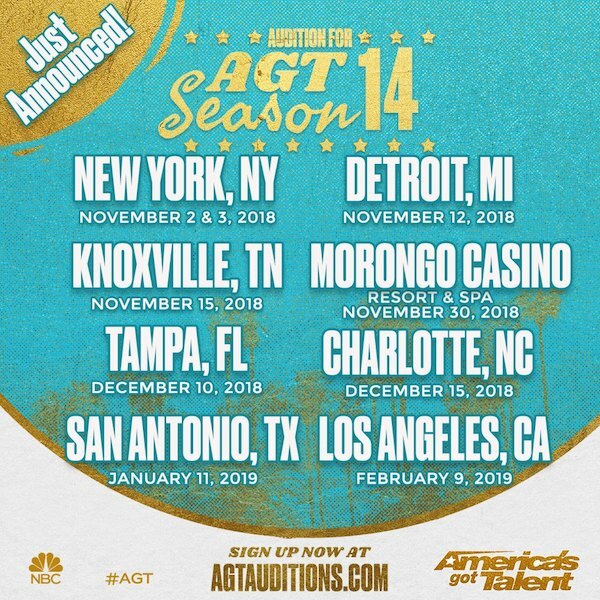 Auditions began last month for America’s Got Talent Season 14, with judges visiting New York, Detroit, Knoxville and Morongo Casino in California to audition performers. Soon auditions will recommence, with stops including Tampa, Charlotte, San Antonio and Los Angeles. If you believe you have a one-of-a-kind, star-worthy act, then be sure to register and attend an upcoming audition. If you are part of a group only one member needs to register for the group. If you do not see your city on the tour schedule and you’re unable to travel to audition in-person, you can submit a video audition. For more information, visit www.AmericasGotTalentAuditions.com. Also, note that America’s Got Talent will soon present a holiday special. Tune into NBC on Monday, December 17 at 10/9c to watch.